Functions: Design and accents built with flattering lines, and functional panels to ensure comfortable fit and ease of use. Zip-off sleeves options available. Coordinate your image and continue it from year to year. 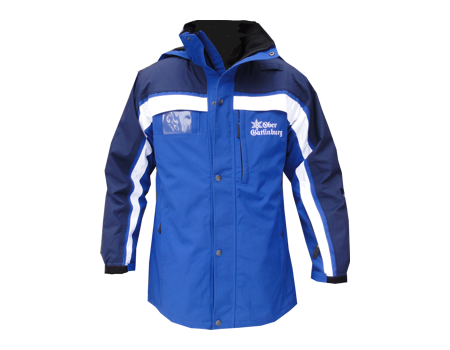 Jackets are standard with adjustable shock cord t bottom. Optional snow/wind cuffs in sleeves and at waist. Soft brush, chin guard (optional). Extra-long front placket pocket that fits a clip board, or hat, etc. Articulated elbows. Integrated hood. 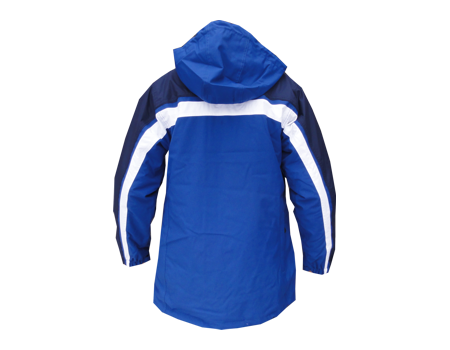 (Options for Zip-off hood available with larger or over-run orders). Call for details. Other options include radio pocket, convenient fore-Arm pocket, and other well-placed storage pockets. Clear vinyl name-tag slot or badge tab attachment options. Your logo / patches embroidered and taped in production with large orders. Reflective options available. Customize: Color your own panels with smaller orders, customize other features with larger orders. Several panel options available in this style (strait or slanted pockets, special colored zippers, streamlined design). Popular custom options are – choose your own length, type of hood, pocket specification, piping or accent options. Call for details. Item shown are as customized by Customer.